The Indian space agency's century emboldens it to embrace the private sector. Almost unsung, the Indian Space Research Organisation (ISRO) has completed a century of launching satellites in space! This was in true Test cricket fashion a slow plod taking almost 36 years, since the first satellite to be launched from India was Rohini in 1980. In a bold first move, ISRO is also opening its doors to the private sector to make not just components but full satellites. This is quite a leap in space by ISRO, which has till now endeavoured to fabricate all satellites in-house. In another parallel but very significant development, Team Indus, a Bengaluru-based private space start-up which is attempting India's first private moon shot, got a big boost when on June 29, when the French Space Agency (CNES) inked a 'letter of intent' with this young bundle of energy whose motto is 'aspire, believe and create'. For the French space giant to even think of flying a high-end camera on the module Team Indus seeks to send to the moon is a hugely positive movement. Team Indus was India's only entry for the US $20 million Google Lunar X Prize. Speaking at the Toulouse Space Fair, Jean-Yves Le Gall, President of the French space agency, said, "CNES must look for excellence where it is to be found, for today's space technology will drive tomorrow's technology revolutions and growth. In joining forces with Team Indus on this mission to land a rover on the Moon in 18 months' time, CNES is showing that innovation in France has a key role to play in new space. These new players are doing things differently and working to short schedules by deploying innovative methods. The average age of our new partners is 30, so we will learn as much from them as they will from us." Back to ISRO's big commercial success which has launched 113 satellites into space. To be precise on May 22, on this 36th mission of the Polar Satellite Launch Vehicle (PSLV) it sent 20 birds soaring into space in a single perfect mission. There was no overt celebration of the achievement of the century and the understated chairman of ISRO A S Kiran Kumar simply said "a job done". This was also a hugely significant launch since for the first time ISRO launched 17 foreign satellites all on commercial basis. Interestingly, 13 of these small satellites were from the US, which shows the growing confidence the American entities have on the Indian launcher. 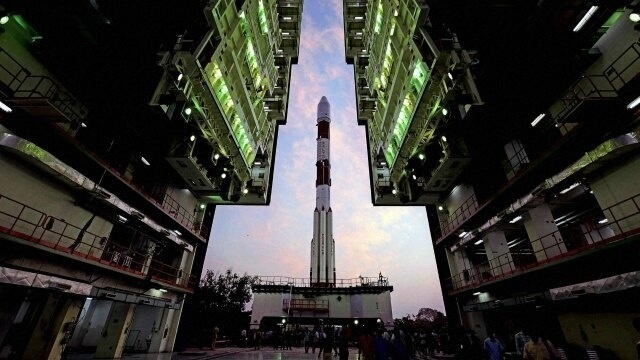 Most importantly for reasons of commerce when a whiff of privatisation seems to be drifting through ISRO, there was one satellite that was from the stable of the Internet giant Google. The 110kg earth imaging SkySat Gen 2-1 satellite is owned by Terra Bella, a Californian company owned by Google. This was the first time an Indian 'new space' start-up called Earth2Orbit (E2O) negotiated the launch contract on behalf of Google and Antrix Corporation. Suggesting Indian private companies are beginning to show a mark. Susmita Mohanty, Chief Executive Officer of E2O, Bengaluru, said, "This is a Berlin-wall moment in (Indian) space history which will pave the way for more American launches on the PSLV and enable other Indo-US commercial space engagements in the future," adding the launch represents a landmark in space-related collaboration between the world's two largest democracies.